Locations - SIA Wildlife Control Inc.
We are proud to announce our service location areas within Ontario. We operate and offer a variety of pest control and wildlife removal services in the following cities. The city of Newmarket has a population of 80’400 recorded in the year of 2009. Newmarket is flourishing with new housing, containing 2000 inhabitants per square kilometer. Generally, wildlife removal calls are moderately common throughout the year in Newmarket. We have steadily provided pest control and wildlife control services in Newmarket since 2016. Aurora situated below Newmarket, within the Greater Toronto Area. With a population of 53’203 recorded in 2011. Aurora sits just south of Newmarket and shares commonly the same amount of pest control and wildlife removal problems as Newmarket. Wildlife Control problems in Aurora include birds, bats, raccoons, squirrels, skunks and more. Georgina located by Lake Simcoe, in the northernmost municipality of York Region therefore within the Greater Toronto Area. Having a population of 43’517 recorded in 2011. Georgina has more green and less population. This allows wildlife to have shelter. In return we see less animal entries into people’s homes as frequently as larger and more developed areas of the GTA. Seldomly raccoons and wildlife problems occur in Georgina homes. However we do tend to wildlife control problems in Georgina from time to time. As Georgina develops every year, there will be more incidents involving wildlife removal. Major issues involving georgina are skunks, raccoons and squirrels. 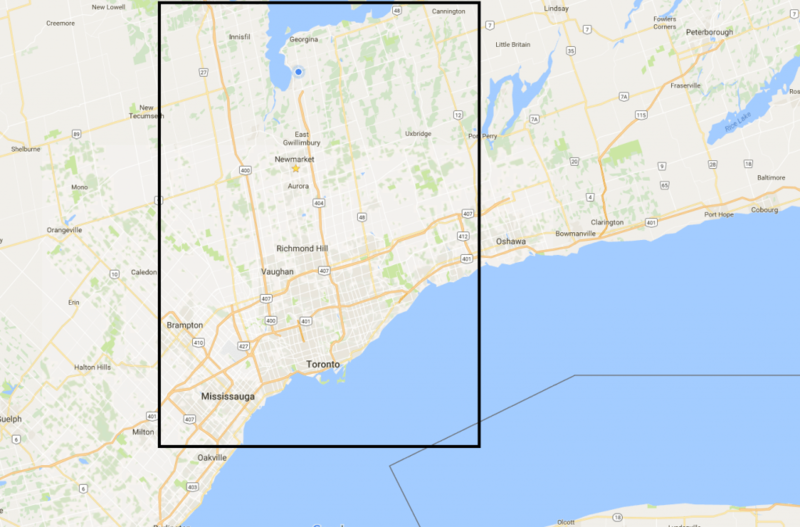 North of Toronto sits North York, it was once a former municipality in the city of Toronto. It now comprises the central part of the northern area of Toronto. In 2011 the population of North York was recorded at 655’913 residents. Toronto has the largest infestation of raccoons, consequently making North York along similar numbers. Pest Control is a busy service in North York because of tight housing and food sectors. Above all, food sectors by law should have a pest management program in place to avoid rodents. Contamination of food is a serious problem in Ontario, consequently the law requires all food sectors to have a pest control action in place. Mississauga is located west of Toronto. Which also shares Lake Ontario next to Toronto. The city has a population of 713’445 recorded in 2011. Wildlife removal in Mississauga is a peak operational location because of the size and wildlife density in Mississauga. Pest removal and control in Mississauga is evenly competitive with the Toronto area. Mice and Rats plague town homes and food sectors and must by law have a pest program for the control of pests in the food industry. Mississauga residential areas suffer from raccoon, squirrel and skunk activity which regularly interferes within residential properties. We have served the Mississauga area in residential and commercial areas for the past 3 years. Brampton is just north of Mississauga. It is part of the Greater Toronto Area and a place where wildlife bloom. Brampton could quite possibly be one of the top cities with raccoon, squirrel, and skunk presence. The population of Brampton was recorded at 523’910 in 2011. Mostly, homes in Brampton come in a variety of bungalows, 2-story and semi-detached styles. Each type of home come with it’s own set of problems when dealing with pest or wildlife issues. For instance, bungalows make wildlife removal in the baby season difficult because of attic access. Furthermore semi-detached homes cause a significant problem for pest exterminations because of the extra treatments required for more attic spaces. We have been solving pest and wildlife problems in Brampton with trained and licensed technicians who provide nothing less than excellence for years. Scarborough became part of the City of Toronto since January 1, 1998. Geographically Scarborough is located to the east of Toronto. The area sees wildlife activity as frequently as it’s neighboring cities. The population of Scarborough recorded in 2011 was 625’698 residents. In contrast to other cities, scarborough homes are in favor to wildlife problems due to their convenient roof slopes. There is a high volume of pest activity such as mice in the semi-detached communities of Scarborough. Due to residential semi-detached homes sharing an attic, more control and exterminations are required to rid homes of mice and rats. Vaughan is located north of Toronto, within the region of York. To begin with, it was the fastest growing municipality in Canada from 1996 to 2006. The population census in 2011 recorded 288’300 residents. Raccoons, squirrels, skunks and wildlife flourish in these areas within the vicinity of Toronto’s blooming wildlife population. Wildlife and pest problems are a regular day to day business in Vaughan. Richmond Hill is located in the southern portion of York Region. It was the third most populated municipality in 2011. As a result of developing homes, wildlife problems have increased in Richmond Hill during the years. The recorded population for Richmond Hill in 2011 was 185’540. Richmond Hill is one of the peak activity cities for raccoons and squirrels and this is especially true for the baby seasons. We provide top quality wildlife control and pest exterminator services in Richmond Hill in all seasons. Markham is located just east of Richmond Hill. With a population of 301’709 recorded in 2011. Wildlife activity is similar to Richmond Hill. Our team has been solving wildlife and pest problems in Markham for years. Homes that have nuisance wildlife problems in Markham have trusted us to remedy their problems and make them pest free.